Hugo Zoeller (1852-1933) was a German journalist and explorer who travelled to South America, West Africa and New Guinea in the course of his exciting career. This book is an account, first published in 1891, of his expedition to New Guinea in 1888, during which he became the first European to explore the island's mountainous interior. 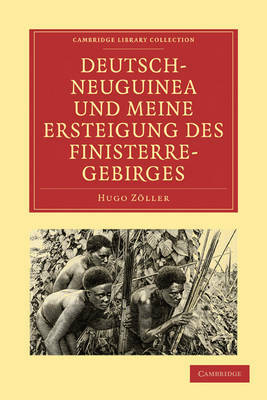 He describes the German colonial settlements on the coast, the logistical preparations for his mission, the climate, geology, flora and fauna of the island, the indigenous peoples and their customs, the local languages, to which he devotes a substantial chapter, and the hardships and highlights of the journey. The appendix contains a timeline listing European activity around New Guinea from 1526 to 1891 and a glossary in tabular form listing 300 words in 45 indigenous languages. A bibliography and index are also included, and the book contains drawings, photographs and maps.